Taylor Swift finally dropped her new album Reputation on Friday (November 10), but we're guessing Kim Kardashian wasn't one of the 700,000 who bought it on release day. Instead, the long-running feud between Swift and Kardashian reached peak petty when the latter opted to attend a Katy Perry concert on the very same day. 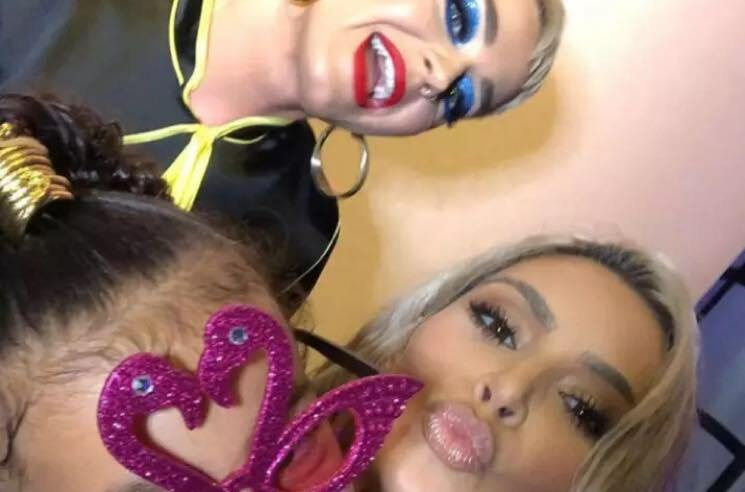 Perry's "Witness Tour" rolled through L.A. on Friday, and both the singer and Kardashian made it known to their millions of Snapchat followers that they were having the times of their lives together hanging out backstage. And while Perry and Kardashian may have upped the ante in the most popcorn.gif-worthy pop feud in recent history by joining frenemy forces, the reality star's young daughter North West didn't exactly have her mommy's back. Twitter users have been hilariously pointing out just how miserable she seemed at the prospect of getting dragged into the drama — basically falling asleep as Kim K lipsynced along to Perry. Swift, meanwhile, is letting her music speak for itself these days. Reputation finds her fully embracing her snake status — bestowed upon her by none other than Kardashian herself, of course. It also hears her totally gunning for Kardashian's husband Kanye West, so we're guessing this feud is only gonna get uglier once the reality star and entrepreneur finally caves and listens to "This Is Why We Can't Have Nice Things." Celebrate Reputation's release by ordering it on CD and double picture disc vinyl via Umusic.